Acting Crime Chief, Paul Williams, has said that police ranks have a duty to ensure they protect the vehicles they would have impounded in their respective station compounds. If not, this would mean that they neglected their duties. And, once it has been proven that a rank has neglected his or her duty, they can be charged departmentally. They can also be charged criminally and subsequently dismissed for tampering with these vehicles. 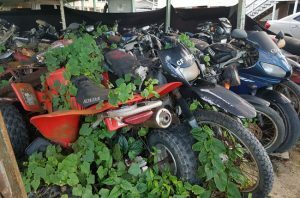 The Crime Chief made this comment in light of an article in last Sunday’s newspaper where a number of persons have complained about losing parts on their vehicles while it was impounded in station compounds across the country. “If we impound your vehicle, we are responsible for it and we are not going to run from that,” Williams said. He added that there is a procedure that ranks follow when impounding a vehicle. When vehicles are impounded in any station compound, a description of the vehicle is recorded by the rank who would have impounded the car, bus, motor lorry, motorcycle or bicycle. “What we do is that once the information is recorded and the rank is ready to hand over to another rank, that other rank has to go and examine the vehicle to ensure all the parts and components are intact,” the Crime Chief said. He added that if it has been found that ranks are not following this procedure then they will have to revisit the Guyana Police Force (GPF)’s standing order for impounding a vehicle. Additionally, he said that these ranks can be charged departmentally for neglecting their duties and responsibility. If it has been found that ranks have colluded with others to remove items from a vehicle then that policeman will be charged criminally and subsequently dismissed from the force. Some drivers have been complaining that batteries, lights, windscreen wipers, decks, mirrors, gear sticks, bicycle chains and even windscreens have gone missing from their vehicles while impounded in some station compounds. Most of the reported cases come from the Brickdam Police Station and the Criminal Investigation Department (CID), Eve Leary, Georgetown. Some of these drivers have refused to make police reports because of the slow pace of the police investigation. When vehicles are involved in any illegal activities, they are impounded as exhibits in a station compound, closest to the scene of the crime until the matter is resolved in the courts. Because these court matters take time, some ranks allegedly “treat” themselves. Toyota Allions, Premios, and 212 cars, and motorcycles are the most targeted. A police rank had told this newspaper that when vehicles are impounded, some of his colleagues start putting their names on parts the same day. “So what happens is if a car is involved in a robbery? They (ranks) know it will be at the station for a long time so what they do is start indicating what they need. I remember one time a rank examined a 212 and said he needed the deck for his car since his was stolen,” the rank said. 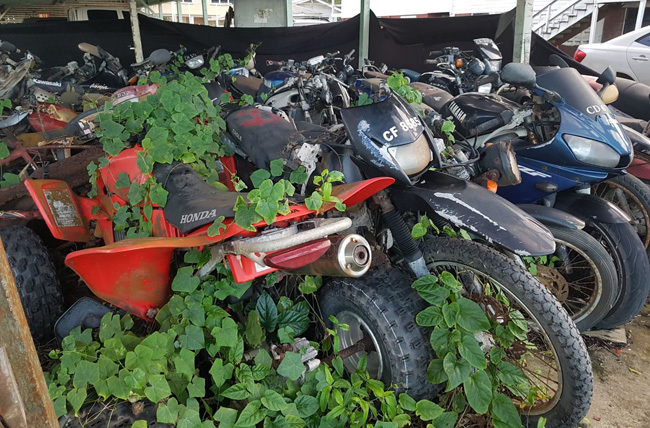 Kaieteur News has been informed that very senior ranks in the Guyana Police Force have taken parts from impounded vehicles. “If one of them was involved in a li’l jam up, they does come around and see which vehicle deh long and then they gon ask for the light and when you have such a senior person asking for something, what can the junior people do?” the rank stated. Kaieteur News has had a similar experience at the Brickdam Police Station. One of its motorcyclists was involved in a minor traffic offence early this year. Although the matter was settled, the company had a difficult time getting back its motorcycle because it was purchased from a private individual and had not been transferred as yet. As a result of this, it took some four months for the company to get back the motorbike. On the day it was returned, the rider couldn’t even recognise the motorcycle, since the headlight, trafficator box and battery were missing. Nothing came of that matter.